Backgammon boards, precision dice, doubling cubes, backgammon books, dice cups, backgammon checkers - an amazing backgammon world only for backgammon enthusiasts! 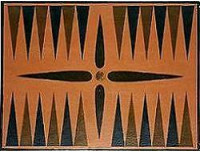 We love backgammon, we have more than 40 years experience and we will therefore know how important it is with correct backgammon gadgets. Expect that we do everything for you to be happy with your backgammon purchases, and enjoy your backgammon gadgets long time ahead.